Loren Gabel wastes no time: Loren Gabel, a 2018 NWHL Draft Pick (second round, eighth overall by the Buffalo Beauts) and the 2019 Patty Kazmaier Award winner, needed only 9:08 to score her first goal with the senior national team. The two-time NCAA National Champion found the back of the net 116 times at Clarkson. "[Brianne] Jenner got the puck and made a nice pass into the middle of the ice," Gabel told IIHF. "I shot it on net and it went in." 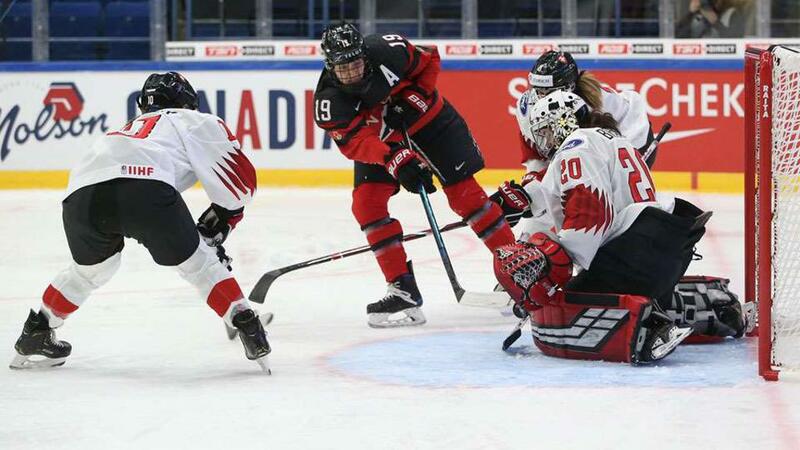 Early and often: Team Canada veteran Natalie Spooner (CWHL Toronto Furies) doubled Canada’s lead to 2-0 just 16 seconds after Gabel’s goal with a rocket from the high slot. Doubling up: Four members of Team Canada finished with two points. Emily Clark had a pair of goals, while Spooner had a goal and an assist, and defenders Laura Fortino (CWHL Markham Thunder) and Renata Fast (CWHL Toronto Furies) each picked up a pair of helpers. Jamie Lee Rattray (CWHL Markham Thunder) and Blayre Turnbull (CWHL Calgary Inferno) also scored for Canada. Late burst: After Gabel and Spooner’s quick goals in the first period, the Swiss held Canada off the scoresheet until the third period. But Canada asserted its dominance in the final frame, scoring four more, with Clark scoring her first of the game just 1:25 into the period. Just keep shooting (and don’t let them shoot): Puck possession was the name of the game for Team Canada, as they outshot the Swiss, 53-6. 2019 NWHL Goaltender of the Year Shannon Szabados (Buffalo Beauts) wasn’t tested much in the shutout, her fifth on the World Championship stage. Success over the Swiss: Canada has been notably successful against the Swiss. Since 1997, Canada has outscored the Swiss, 56-0. This was Canada’s sixth straight win over Switzerland at Worlds. Despite the dominant win, Spooner believes Canada still has room to grow. "We're obviously hoping to improve throughout the tournament," said Spooner. "I thought we did some good things, but also have some things to improve on. Obviously we got some shots and got some goals, but we did give them a few chances that we probably shouldn't have. But I thought for our first game, we're going to keep building off that." Canada’s next game is a much-anticipated matchup with the United States at 12:30 PM ET on Saturday. The game will be broadcast on NHL Network in the US and on TSN in Canada.